TWRA’s Delayed Harvest Trout Program "A unique fishing opportunity". TWRA’s Delayed Harvest Trout Program “A unique fishing opportunity”. has developed goes great with this time of year and beyond. It is called Delayed Harvest Season or DH season for short. In a DH program a section of a stream is stocked with trout in the fall and harvest is not allowed until the following spring around the time the regular spring trout stocking seasons begins. In Tennessee DH seasons end on the last day of February when the streams become open for harvest. Trout stocked in DH streams are of quality size and are stocked in sufficient numbers to provide quality catch and release fishing. An additional benefit to these DH stockings is that stocked fish will put on some growth over the winter providing for a boost in fishing quality once the spring season begins. In Tennessee we currently have DH streams in Regions 3 and 4. In region 3 the Hiwassee (Polk Co.), Tellico (Monroe Co.) and Piney Rivers (Rhea Co.) have DH Fisheries. In region 4 Paint Creek in Cocke County has a DH season. The Hiwassee River, Paint Creek and Tellico River DH seasons begin October 1 and end on the first day of February. The DH season on the Piney River begins on Nov 1 and ends on the last day of February. 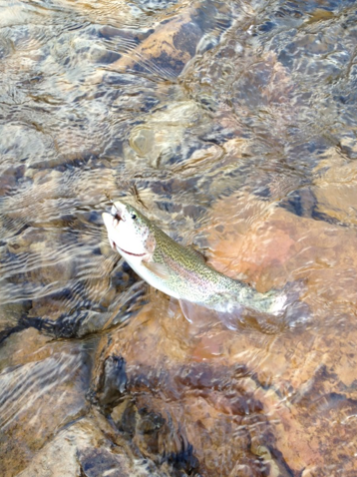 The stocking of the Piney River is dependent upon water temps and is sometimes delayed. We will announce the Piney River stocking on our Facebook page and on the TWRA website. During the DH season, only artificial lures are permitted and the use or possession of bait is prohibited. Because these are catch and release fisheries anglers are encouraged to use care in releasing fish. Having a landing net and forceps to remove hooks will aid in getting the fish back in the water quickly. DH waters can be fished with the following licenses; Annual Hunting and Fishing Combo with an annual trout permit, a One-Day fishing all species, an Annual Sportsman license (including the senior type) and the Lifetime Sportsman. For non-residents any license type that includes trout can be used. Each stream has a specified section where the DH season applies. These sections are identified in the 2017–18 Fishing Guide in the Trout Section. The location of these DH streams can be found on the TWRA website. Until next month, have a great fall and catch one for me right here in Tennessee.